Whether you’re planning your pregnancy or whether you just found out you’re pregnant, you need to have a plan for how your business will continue to operate while you’re pregnant and during your first few months of motherhood as well as a plan for how much work you’ll want to take on in the future. This article covers come of the things that I believe it’s really, really important to think about the minute you start planning a pregnancy or find out that you’re pregnant. As sole proprietorship businesses, most photographer’s don’t “pay themselves”. We don’t give ourselves paycheques or take only an exact portion of a deposit for our spending money. We typically just use what we need and make sure we have enough put aside to cover albums or anything else the photographer is owing. When you’re about to have a baby, there’s a lot of things to spend money on. Cribs, bouncers, clothing, cute nursery decor – the list is truly never endless. It’s important that you save more money than you spend when you’re pregnant (or thinking of becoming pregnant) because you need to prepare for the “what if’s”. What if you end up on bed rest and can’t shoot the wedding? Will you have the money to refund them? Will you have the money to pay an associate shooter to step in for you? What if you’re very ill throughout your pregnancy and can’t find the energy to edit. Will you have the money to outsource your editing? What if you simply have to refund a client because they don’t want an associate shooter? If you know you have the money to prepare for these possible “what if’s” it’s going to make the process a lot less stressful than having to find a way to come up with the money at the last minute. If you’re planning a pregnancy before you set your prices for the year, consider adding in the cost of an assistant into your cost of doing business so that it’s compensated for in your prices and you’re not out of pocket for it. An assistant is someone who isn’t shooting; their main job is to carry ALL your stuff for you and get you water or anything else you need throughout the day. An assistant doesn’t need to be a trained photographer – they can be anyone. Assistants typically get paid minimum wage; maybe a wee bit more. Even then, paying for an assistant for all your engagement and wedding shoots is a large cost if it’s coming out of pocket but it’s totally worth it. It helps make the day as easy as possible. 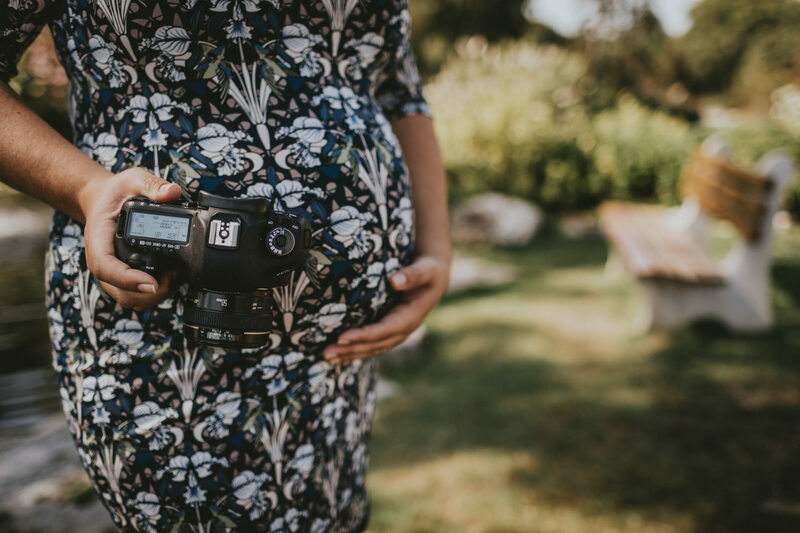 If you don’t normally work with second shooters, it’s probably not budgeted into the costs of your packages – if you’re thinking of becoming pregnant and are due for a price adjustment, consider adding in the cost of a second shooter into your cost of doing business. Having a second shooter comes in handy when you’re pregnant. They can double as an assistant and help you with gear but they can also help you out when you physically can’t do something. Want to get a super-low-down angle and can’t lie on the floor? No problem – have the second shooter do it. Would you get a super sweet shot if you climbed up on something but can’t managed with a 7-month pregnant belly? Have the second shooter do it. The second shooter can also take care of family photos while you rest if you need it or they can at least help get you water and do what they can to make your job easier. Oh, and morning sickness…. if you need to take off to the loo due to nausea, they’re there to cover for you. Having a second shooter is really beneficial when you’re pregnant and if you don’t have it planned into your cost of doing business, it’s going to be a stress on your finances as the costs of a great second shooter will add up. Like it or not, there will be “blackout zones” for shooting and “Blackout zones” for the business entirely. You need to think about these and put a plan into place. One of the blackout zones that you’re going to have to deal with is the meetings/editing blackout zone and this is usually around the birth of the baby and shortly thereafter. When will the computer get turned off before the baby comes? When will you start doing consults again? When will you stop shooting? When will you start shooting again after having the baby? What if you end up having a C-section and have a lengthy recovery but were only originally planning on taking 3 or 4 weeks off? While start and stop times of shooting will vary person to person, the amount of time you take away from your business in regards to accepting consults is typically minimal. While most new mamas don’t want to go back to work right away, they inevitably open one or two days up a week for consults within a few weeks of birth as passing up consults today means less income in the future. As a wedding photographer, the client we meet with today helps pay our mortgage a year from now, so taking minimal time off in regards to consults is fairly normal. A lot of new moms will post messages in groups saying “I’m just too overwhelmed, I can’t get my editing done – where should I go for outsourcing?” While I always recommend The Image Salon since I feel their quality is superb, I also have to tell the truth… outsourcing isn’t an immediate solution to your problem. It takes time to get the perfect results from your editor; sometimes it takes 1-2 weddings (or engagement sessions) sometimes it can take 4 or 5. Finding that perfect fit with your editor can also be stressful; you’re spending money on editing and yet it takes a few tries and a lot of feedback for the editor to really get your style right. To anyone out there who is recently pregnant or planning a pregnancy, I highly recommend finding your ideal outsourcing company and getting your style established with your editor well before your third trimester if you want to avoid too much stress. What other plans did you have to put in place or consider for your business when you were pregnant? Tell us in the comments!